The Destiny 2 beta kicks off today, and there's a big update to download. You'll also need PS Plus or XBL Gold to play everything in the beta. The Destiny 2 beta kicked off on PS4 today, and it's coming to Xbox One tomorrow, at least for those who pre-ordered the game. There was an update to the client last night, and it's a whopping 12.6 GB. That's not surprising, as folks who pre-loaded last week reported that the download was only about 400 MB. Also announced last night via Bungie's official Twitter was the news that while anyone can play the beta's "Homecoming" story mission, you'll need to to be a PlayStation Plus or Xbox Live Gold subscriber to participate in the Strike and Crucible offerings. The PS4 beta started at 1 PM ET today, and the Xbox One beta begins at 1 PM ET tomorrow. Both of those times are for pre-oder customers only. 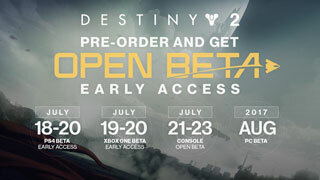 If you want to try before you buy, you'll have to wait until the beta opens for everyone on Friday, July 21 at 1 PM ET. The beta period will end for all players on Sunday, July 23 at 11:59 PM ET.